Amyloid-β (Aβ)-induced Ca2+ influx into neurons has been well described since it was first reported almost 20 years ago. Ca2+ influx can disrupt mechanisms of long-term potentiation and long-term depression and increase neuronal susceptibility to excitotoxicity. 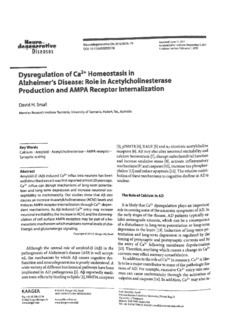 Our studies show that Aβ also causes an increase in acetylcholinesterase (AChE) levels and induces AMPA receptor internalization through Ca2+-dependent mechanisms. As Aβ-induced Ca2+ entry may increase neuronal excitability, the increase in AChE and the downregulation of cell surface AMPA receptors may be part of a homeostatic mechanism which maintains normal levels of cholinergic and glutamatergic signaling.